Everyone wants their wedding to be unique, right? So why should you be any different! 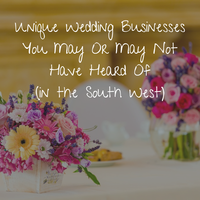 Take a look at our pick of the top 5 unique wedding business that you may or may not have heard of in the South West! Two and a half years ago my now husband proposed to me in the most romantic way, with a treasure hunt leading me to our favourite restaurant. It was so beautiful, and I happily said yes and we started planning the wedding pretty much straight away. At the time, we were both working in the local hotel industry, him as a reservations manager and myself as a wedding and events coordinator. Being fully immersed in the industry, it would have been fairly easy to have called in a few favours, and held our wedding in one of the many lovely local hotels and venues Bournemouth has to offer, but instead we decided on a wedding abroad, and picked Santorini as our destination.